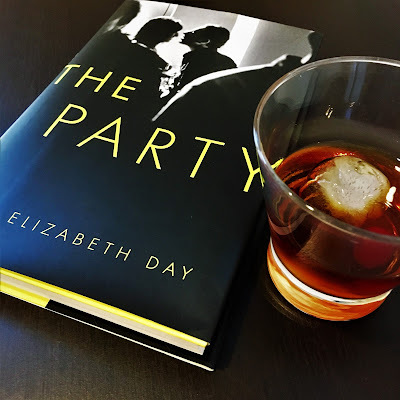 As I was (voraciously) reading my copy of The Party by Elizabeth day (provided as part of my Little Brown & Company ambassador program), I couldn’t help but think about the effect of an unlikable character on a narrative. Martin, the main character, is morally ambiguous at best. But this information is delivered like breadcrumbs left in a trail for the reader to piece him together, as well as the mystery of why the story begins with his police interrogation. Unlikeable characters seem to be an obstacle for many readers and, for the most part, I would include myself in this assessment. At least I thought so. But there are exceptions, including the aforementioned book, as well as the ultimate example that leaps to mind: Gone Girl (which is always excellent food for thought). Funny enough, The Party is the first book the TRULY reminded me of reading Gone Girl. Something sinister is afoot from the beginning, and the tension builds as you learn more about the past and all of these ostensibly irredeemable characters. Additionally, part of the story is told through flashbacks, police investigation, and the diary entries of Martin's wife. And, like Gone Girl, I devoured it! It was really compelling stuff. Of course it's had me thinking about what makes these characters readable for me, and other 'unlikeable' characters infuriating? The first realization I had is that they are thrillers and I tend not to put myself in the shoes of someone who is, for lack of a better word, crazy. So the suspension of disbelief is built in: this is totally not who I am, nor anyone I know, and it is FASCINATING. Clearly Amy Elliot-Dunne is a unique character and I can't identify with her motivations, but I CAN furiously turn the pages to see what she might do next. Second, thrillers have plot and a sense of urgency. Many of the books that center around a character I did not care for seem to be more of a sociological study than a story - such as Hausfrau or Rich and Pretty. I have a hard time with this type of book as it is, so not having an emotional investment ruins the reading experience. Lastly, the characters that inevitably ruin a book for me are the kind that make repeated stupid mistakes and never learn from said blunders. Yes, we all make mistakes and the plot of a great story usually revolves around one. Yet either you can identify with choice the character makes (however stupid), or he is penalized, or learns from his transgressions. In the party, Martin is a very unlikable guy, but it is easy to see why he does the misguided things he does, which in the end, leads him down a dark path that is revealed by inches with searing commentary on current culture, including class and sexism. OK, obviously I enjoyed The Party. Any recommendations for other despicable, yet fascinating characters? Would love to hear more thoughts on on this pervasive trend in books! The 'Big Dark' has descended upon my neck of the woods, in the Pacific Northwest, and I kind of love it. I am a homebody and love nothing more than to sit with a hot beverage, under a cozy blanket with a book - bonus points if it's on a Friday night! My mom can attest to the fact that I was basically a Linus growing up and constantly wrapping myself in a blanket - and reading, of course. Fall reading is the best time for reading - here's an article from Bustle to back up my hypothesis. Since I've covered summer reads and winter/holiday reads, I figure it's time to pull together a nice list of 'cozy up with a blanket while the leaves fall and rain patters the window' kind of read. To be honest, for a long time, I thought that seasonal reading was sort of ridiculous. A good book is a good book, no matter what time of the year. That definitely still holds true, but I think you can certainly elevate your reading experience with certain books. I read Still Life, Louise Penny's first novel in her Inspector Gamache series, during the summer last year. I enjoyed it, but can't help but think I would have enjoyed the atmosphere of Three Pines a little more if I had saved it for a rainy fall day. Might as well start off with some Louise Penny and the aforementioned Still Life, which is a perfect 'not too gruesome' mystery vividly set in this small town full of whimsical characters. The Raven Boys by Maggie Steifvater is a series that all readers should experience, and fall is the perfect time of year. In this story about boarding school boys on a secret mission and the girl that befriends them, the author's character development, setting a scene and a FEELING is unparalleled. The whole series is gorgeous, unique, magical and unforgettable. Plus, boarding school and a magical forest, that figures prominently in the books, screams autumn to me. Mr. Penumbra's 24 Hour Bookstore by Robin Sloan is a delightful adventure mystery that begins in a dusty old bookshop and is reminiscent of an Indiana Jones caper. It's a fast read and under 300 pages - perfect for a one day sitting in a cozy chair. Fingersmith by Sarah Waters: Dickensian England, plots within plots, and a fantastic love story. Yes. 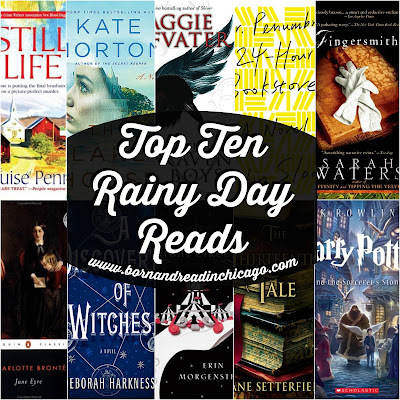 Jane Eyre by Charlotte Bronte is one of my favorite classics and it is perfectly brooding, romantic on the rainy English moors kind of a read. A Discovery of Witches by Deborah Harkness has the perfect October vibe: witches, vampires, Oxford university in the fall, dusty caverns of the library. If you haven't read this one yet, you're in for a treat. I have yet to follow up with Shadow of Night or The Book of Life , but plan to eventually! The Night Circus by Erin Morgenstern is one that I always recommend and then bite my nails wondering how it will go over. It's a real love it or hate it kind of book, heavy on atmosphere and magic. But it's uniqueness and sublime love story just blew me away. Technically I recommended The Thirteenth Tale by Diane Setterfield as a winter read. However it is so good, and equally delectable on a rainy day, that I had to add it to the list. It is a perfect Gothic mystery and another must read, if you haven't already. FYI, links above are to reviews I've written here or to Amazon affiliate links if they predate the blog! We kicked the month off with a brunch outing the weekend before the school craziness set in. 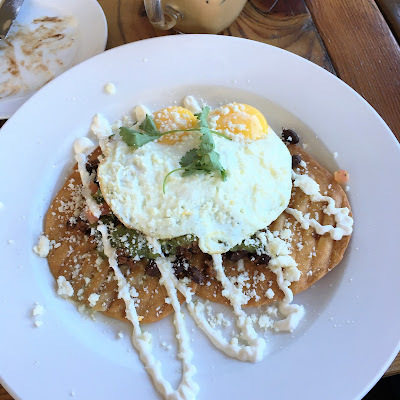 Mmmmm, huevos rancheros. 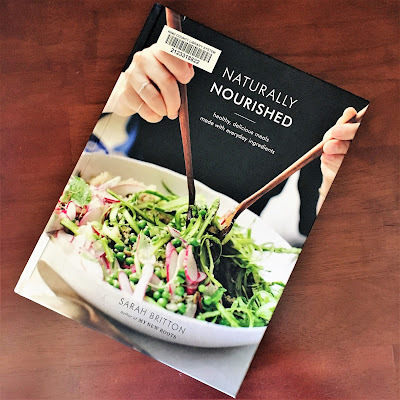 And it has indeed been a bit busy this month with school commitments and evening soccer practice times that necessitate tried and true easy recipes. So, I didn't get around to many new ones, however the few new things I DID try were delicious! Muffins (or a cookie variation) are a go-to breakfast for me: I like to make a huge batch to store in the freezer and pop in the microwave in the morning. 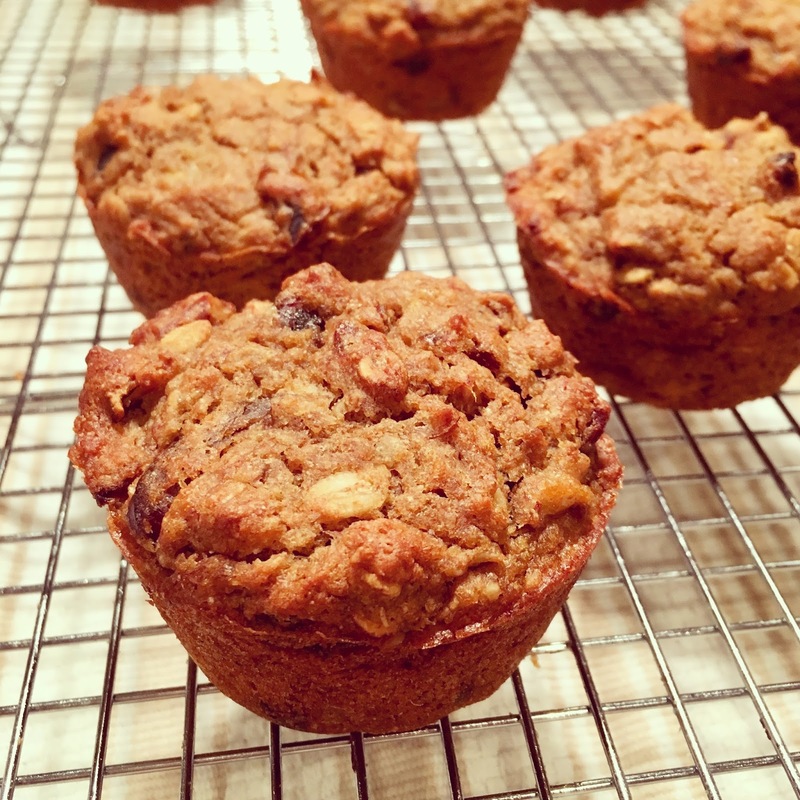 I was looking for something new and seasonal - these Sweet Potato Date Muffins were PERFECT. It's from Sarah Britton's book Naturally Nourished , and you can find the recipe here. 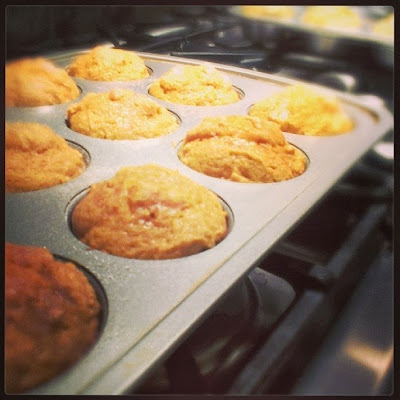 Also great this time of year are my lightened up version of Pumpkin Snickerdoodle Muffins! 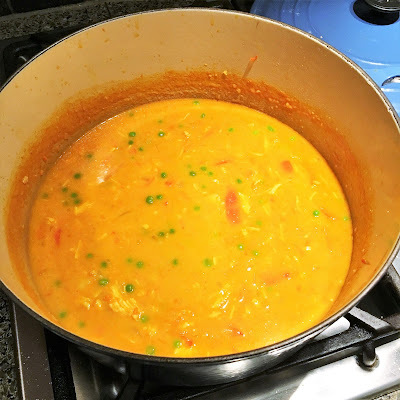 As the days get colder, I'm always craving comfort soup recipes and this Coconut Curry Soup from Pinch of Yum was super easy (I highly recommend an immersion blender) and delish. 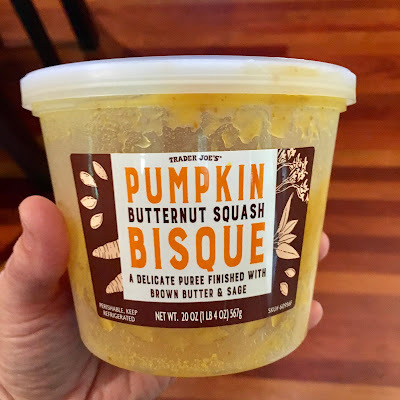 The Tomato Feta Soup from Trader Joe's has been a favorite for awhile, but this new Pumpkin Butternut Squash Bisque is equally delicious. We ended the month with a trip to our favorite restaurant in celebration of our 15th wedding anniversary! 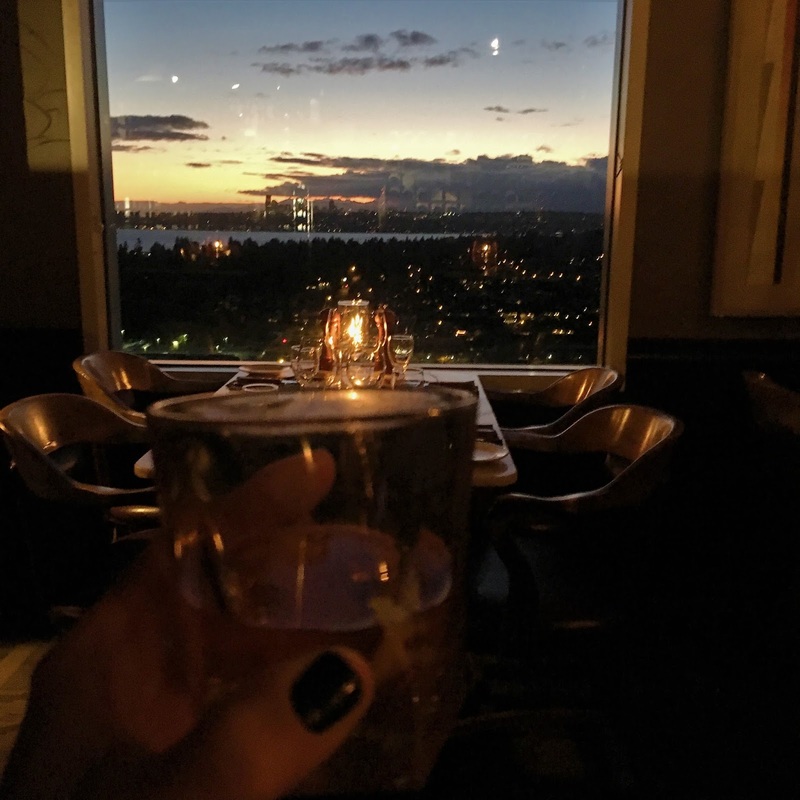 Daniel's steaks can't be beat, plus the view of the sun setting on Seattle and the Olympic mountains isn't too shabby either. This was the first review copy I read provided by Little Brown as part of their ambassador program, and it was a lovely surprise. I was a little wary about what seemed like a lack of plot - yet I immediately identified with the protagonist Barbara, as she navigates life with her five children (one still in the womb) after the death of her husband. It reminded me a great deal of Commonwealth - just an engrossing, intimate portrait of a family and how seemingly small events, and our perceptions of events, have such a huge impact on generations to come. The point of view shifts between Barbara and her prodigal son Francis to give the full picture of the family as it evolves over a generation. There was a section in the middle of the book dedicated to Francis' journey that felt a bit long, especially since I loved Barbara the most. Overall though, the narrative moves quickly through time, sometimes jumping nearly a decade forward, and still feels well paced. I really enjoyed this one, and will be thinking of these vivid characters for some time. This story of a girl navigating her mother's death, along with her father and troubled older sister, was equal parts melancholy and hilarity. Elvis Babbitt is one of the more endearing characters I've ever read and her twisted story of love, loss, family and coming of age (including a Guinness attempt of the most rabbit shaped cakes, escaped animals from the zoo, and cross-dressing for comfort) was wonderfully told. "Maybe a spirit evaporates like a vapor off the bag of frozen peas you steam in the microwave: the droplets go everywhere, settle wherever they land." The premise of this story was total catnip for me: two strangers stranded on a remote deserted island after a plane crash. It's like Castaway but the added dynamic of immediate intimacy with another person with whom you'd have to collaborate to survive. The literal and emotional journey of Sophie and Barry was a roller coaster that I burned through in nearly 48 hours. The banter between the two is written with great wit and tenderness, and I definitely held back a few tears at the end. 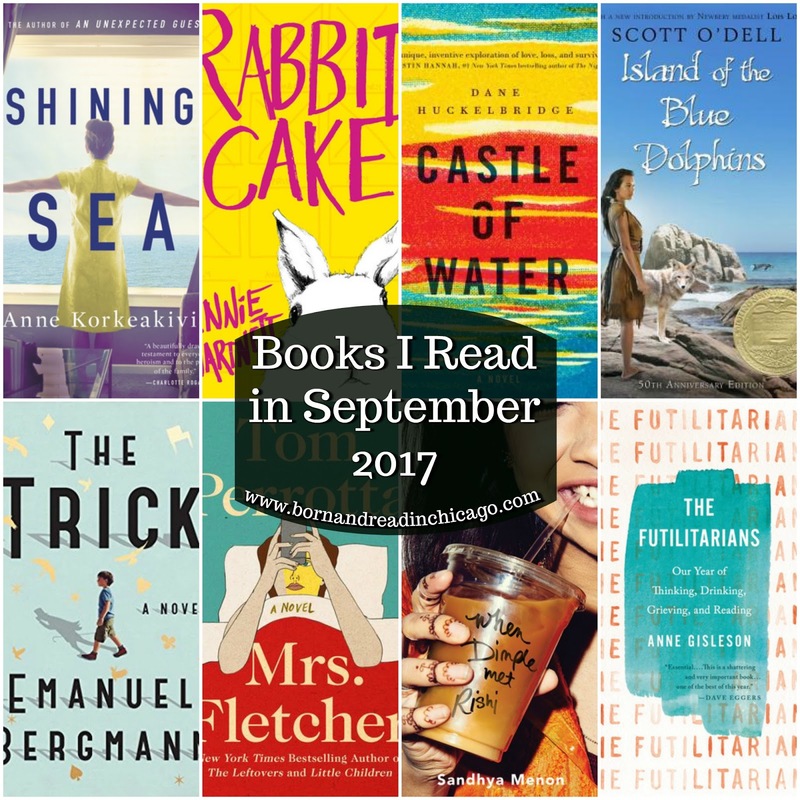 I did not intentionally pick a second stranded on an island narrative when choosing my Newberry read for the month! However, it was an interesting contrast after reading Castle of Water. This was one I don't recall reading as a kid, but I can see the allure it would hold for young readers. Much in the same way The Boxcar Children held my imagination: you can't help but romanticize the idea of being alone, independent and running the show. But after reading the previous novel, the lack of emotional writing felt stark, as if it was a survival manual, rather than a story about a girl who survives. But I also appreciated the nuance of her relationship with the dog Rontu and fleeting relationship with Tutok. 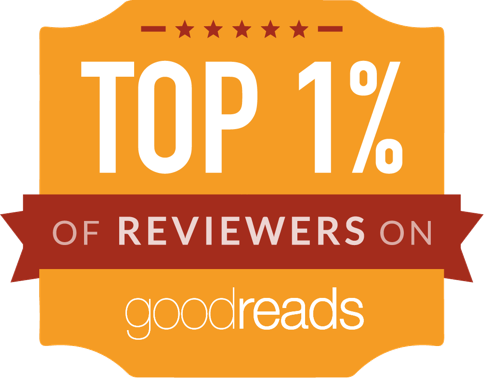 You can read my (favorable!) review here. Not since Where'd You Go Bernadette have I enjoyed such uproarious satire! I have had some of Perotta's books on my TBR for years, and when Mrs. Fletcher appeared on the lucky day shelf at the library, I had to grab it. This story, told in alternating viewpoints of single mom Eve Fletcher and her son Brendan as he flees the nest for college and they both try to navigate their new normal, captures the zeitgeist perfectly. "Young mothers in the schoolyard, on the sidelines at soccer games, at school plays and award ceremonies and graduations, a whole era of their lives - it had felt so permanent while it was happening - suddenly behind them. Just a chapter, and not the story itself." I laughed out loud A LOT, while also cringing a lot. Both Eve and Brendan make some really questionable decisions and suspending my disbelief was challenging in some portions of the book, but it added to the urgency - oh my God, what will happen NEXT? I look forward to checking off more of his work from my TBR now. I had really high hopes for this one, given all the positive reviews and hype. Alas, it didn't work for me. It started off really strong, a story about culture, family, belonging, expectations amidst compelling viewpoints on arranged marriages within the Indian culture. I hope to read other work that might further explore this topic, because this book did not. Pretty quickly, it went from a fascinating situation and character development to formulaic boy meets girl/loses girl YA territory, with an added round of girl loses boy and dragging out storylines of peripheral characters. It became tedious and I just kind of wanted it to end. It held a great deal of promise, so I hope to see more from this author! Side note: I saw The Big Sick this month and it filled a hole that this book left - FANTASTIC film. This was another review copy provided by Little Brown, as part of their ambassador program and it's not the kind of book I would have normally sought out, since I'm not big on memoirs and I figured the existential talk would be over my head. Admittedly, some of it is, yet Gisleson can compare Dante to Hot Tub Time Machine (!) and she intersperses the existential with such accessible thoughts on motherhood, sisterhood, marriage and life. And at it's heart, it is a beautiful and raw ode to her sisters who committed suicide years ago, the death of her father, and the city of New Orleans. It was very surreal to read it during hurricane season and all of the devastation that is happening right now. A memoir that reads like an atmospheric novel is impressive stuff. I haven't been back to New Orleans since Katrina, but The Futilitarians has me absolutely itching to return.